Let us explore paradise together. ORIMtec, Playa de Oro, Lions Club Team up to provide $500K of needed medial equipment to San Felipe Medical Community. 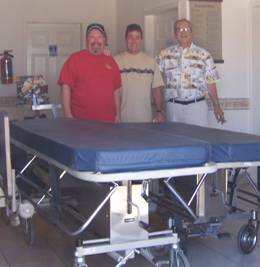 Playa de Oro resident, Daniel Slepian, recognized a need three years ago for medical equipment in San Felipe. 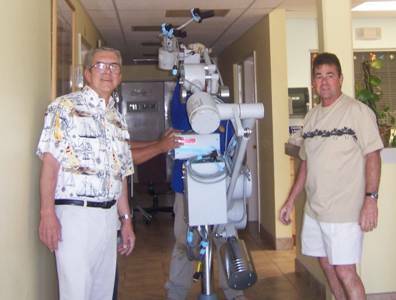 Dan, along with his brother Richard, owners and founders of ORIMtec (a Neurophysological Interoperative Monitoring company), knew of functional medical equipment in hospitals across central and northern California being upgraded. With that in mind, Dan set his sights on procuring three truck loads and over $500,000 worth of diverse equipment to provide to the local medical community. Dan acquired an operating room microscope, anesthesia machine, surgical fiber optic head lamps, two ICU beds, and multiple hospital beds, gurneys and other miscellaneous medical equipment. Attaining the equipment was one thing, picking it up, storing and transporting was another. 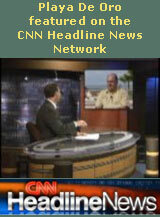 He approached Bruce Parkman, PM&D Developer of Playa de Oro and Playa San Rafael, who agreed to help. Having already donated tens of thousands of dollars to the medical community, Bruce volunteered to pay for the storage and transporting of the equipment to the border. Experiencing frustrating delays at the border, Dan finally approached the Lions Club of San Felipe for assistance. With the help of the Lions Club, members Gary Dilly, Sam Grubb and Scott Parkman were able to accomplish the mission. 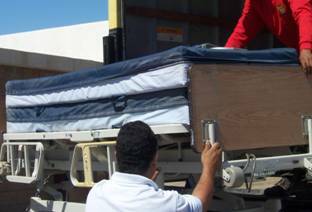 Sam provided three trucks from his company, San Felipe Storage, to bring the equipment across the border and into San Felipe. Dilly, Grubb, and Parkman also donated employee labor to distribute equipment throughout the medical community. At 900 lbs. per bed, this was no easy job! There is one more load waiting in San Luis Obispo with storage and transportation charges again being paid by PM&D. A big thank you from all residents of San Felipe should go to Dan and Richard Slepian. Their company ORIMtec was founded in 1988 in Sacramento. Currently they service over 30 hospitals in Southern Oregon, North, Central and Southern California. They are truly givers and the amount of work and persuasion it took for Dan to achieve this goal was truly monumental. Collectively, the Slepians, the Lions Club combined with Dilly, Grub and the Parkmans, have made San Felipe a better place for us all to live and to receive medical care. And, overall, a safer place to be. Playa de Oro’s Developer, PM&D, has been active in the community since 2001. From paying a City employee’s wages, gas for ambulances, supplying food for Children’s day, material and labor for the new humane Society, and over $40,000 to St. James (now San Felipe Hospital) PM&D shows its support to the community and a willingness to work for the good of all. Playa de Oro and Playa San Rafael are Premier Residential Subdivisions developed by Parkstrong M&D in San Felipe, Baja Mexico. They provide ownership in Gated Sea Side real estate with USA Title Insurance just a 2 hour drive south of the USA border on the Sea Of Cortez. Playa de Oro provides a front row seat to what Jacques Cousteau called, "the aquarium of the World", which is the Sea of Cortez. Sea of Cortez: The nutrient-rich marine environment shelters the planet's highest whale diversity, nearly 900 species of fish and 34 marine mammal species--82 percent of all those found in the Pacific Northwest. Its more than one million acres of mangroves and coastal lagoons provide a critical nesting ground for hundreds of resident and migratory species. 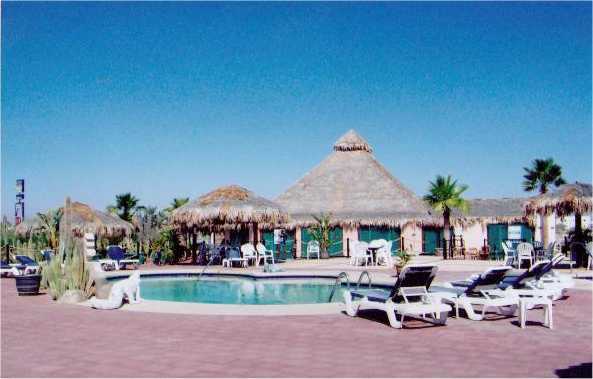 San Felipe is poised on the pinnacle of a development and tourism explosion. Join with us as we ensure this growth is done responsibly. Natural Assets: Perched on the northwestern shore of the beautiful Sea of Cortez, San Felipe lays claim to miles and miles of pristine white sand beaches, and has the majestic San Pedro Martyr Mountains to its back. An ecological biosphere, The Sea of Cortez is the largest protected whale sanctuary in the World and the mouth of the sea is patrolled and protected by Mexican, USA, and Green Peace Ships. Being a tourist town, the local people welcome the many outsiders that come into town each year and most speak some English. There are numerous recreational and social pursuits to provide an active retirement lifestyle. Life is so comfortable here that many transplants now consider San Felipe their main home. The foresight of PARKSTRONG in developing their land into an environmentally-friendly subdivision, making it a reasonable and affordable investment, and ensuring a safe and secure community puts Playa de Oro and San Felipe on the charts for venture opportunity. At a recent developers meeting the Mexican EPA, Profepa, announced that Playa de Oro was the only development in San Felipe that was following all the environmental rules!